Organic baby clothes: Clothing for little people that’s stylish, organic and fair trade. For the past 20 years, we’ve been making organic baby clothes affordable to all. All our sustainable baby clothes start with 100% organic cotton and are certified fair trade. Over the years, we’ve developed strong relationships with manufacturers. This helps us ensure that the working conditions in our factories are fair. We avoid the harsh chemicals used in the traditional cotton manufacturing process, and our organic baby clothes are soft and feel good on little ones’ skin. Stylish, colourful and affordable: Our fair trade clothes are not just sustainable, but fashionable too. Organic baby clothes should be beautiful as well as good for the earth. Check out our current seasonal baby clothes to see our most recent styles. Mix and match our retro vintage pieces together to create a unique outfit. Healthy skincare: We’re proud to now offer natural skincare alongside our organic baby clothes - because your little one’s skin deserves the best. Our organic skincare range is certified vegan and free of chemicals and synthetics. We offer nappy cream, body lotion and hair and body wash. All our skincare products are free from synthetic preservatives, colouring and fragrances. 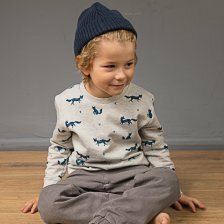 Our story: Long before eco fashion became popular, founder Kirsten Weihe-Keidel dreamed of a range of organic baby clothes that would be affordable and accessible to all parents. As Grandma Wilhelmine used to say “We are not rich enough to buy cheap.” In 1996, Kirsten founded Sense Organics to bring durable, sustainable baby clothes to all. Since then, we’ve helped supply major European department stores and health food shops with organic, fair trade products. With every purchase at Sense Organics, you help us make the world a bit better, one small piece at a time. For us and for future generations. The Sleeveless baby body in 100% organic cotton and are super soft and very comfortable. They have an envelope neckline (also called American neckline) making dressing hassle free and easy to get over the babies head. 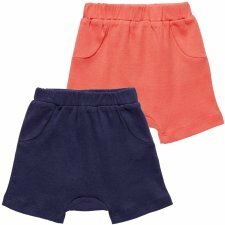 The baby body consists of three nickel-free snaps for easy closure and nappy changes. 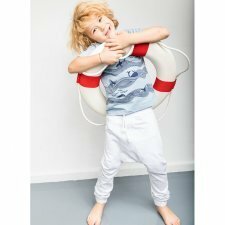 This little baggy pant is made of soft summer 100% organic cotton sweat fabric. It provides light protection on cooler days in summer. The Charles features an elastic waistband, a drawstring with a decorative button at the waist, a baggy style with two decorative side pockets. Baby summer shirt and shorts. Shirt with short sleeve and envelope neck, short with elastic waistband and 2 front pockets. Colour: shirt light blue stripes with elephant applique and shorts in light blue. Colour: shirt coral with peacock applique and short white with peacokc print. 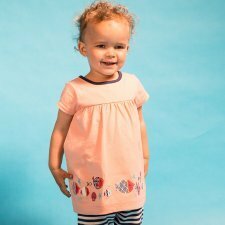 The baby tunic in Salmon is perfect for those hot summer days. The tunic features short sleeves, round neck with three buttons at the back for closure, high waist and an adorable fish embroidered applique at the hem. Made of 100% organic cotton, GOTS certified. Long sleeves body in the finest eco-white organic cotton perfect for the delicate and sensitive skin of your baby. Envelope neck opening for easy dressing opening with nickel free press buttons. Made of 100% certified and skin friendly organic cotton. Interlock 190 gsm. 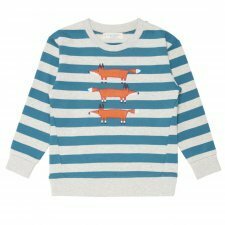 Colour: teal/grey stripes with fox appliqué. Colour: light grey with foxes print. Join us at the seaside with the Short Sleeve Tee. The tshirt boys is the perfect everyday shirt. Made with 100% organic single knit jersey cotton and GOTS certified, this shirt is super soft and features a round neck opening and normal short sleeves. The shirt is available in Navy Stripes + Seal embroidered chest applique. Baggy style pant with a deep crotch. 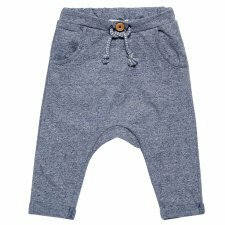 Made of 100% organic cotton, the fabric is very soft and the trousers are super comfortable. 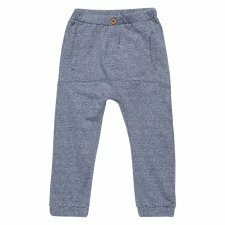 This trouser features an elastic waistband with tie, elastic leg cuffs. And two front pockets. The JON Sweat Pant is a jogger style made of 100% organic light sweat organic cotton making them super comfy to wear. This sweat pant consists of an elastic waistband, side pockets, and a slightly lower crotch giving it a cool look. 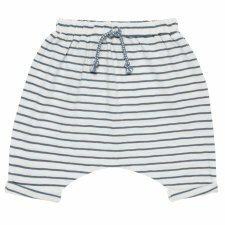 Pyjama in 100% fairtrade organic cotton making it so soft and comfortable to sleep in. 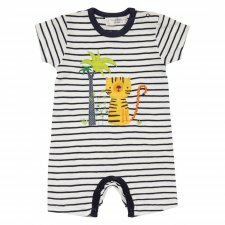 The Long John pyjamas come in stripes and one all over print that your kids will love. 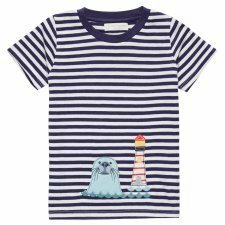 In this collection we are inspired by the sea: fish, lighthouses, starfish and whales. The pyjama tops are long-sleeved and have lovely wrist cuffs. 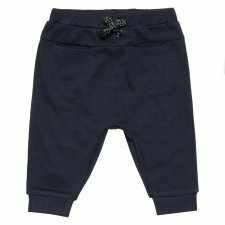 The long pants have a comfortable elastic waistband and cuffs at the leg hems.